Before BR549, before Hank Williams III and Wayne “The Train” Hancock, before The Revered Horton Heat and others, there were the Stray Cats. They were American music’s first retro, throwback band, and even though they’re regarded mostly for rock and roll revivalism, their ties to rockabilly roots and country sounds are undeniable. They were one of the very first bands to make old music cool again. It’s been a desolate quarter century since the band released a record or did anything more than short-run reunion shows, but all that is set to change in 2019 when The Stray Cats plan to go on a big reunion tour to mark their 40th Anniversary, and release a new album as part of it. The new Stray Cats album is set to be released in 2019 on Surfdog Records, and will be produced by Peter Collins who worked with The Brian Setzer Orchestra, and will be engineered by Vance Powell known for working with Jack White and Chris Stapleton. It will be recorded in Nashville. The three founding members of the band reunited in 2018 for a few shows after a 10 year hiatus from playing together, including headlining Viva Las Vegas, and playing two sold-out nights at the Pacific Amphitheatre in Costa Mesa, CA in August. Apparently the chemistry clicked. More details on the new album and tour when they come available. They haven’t aged a day! “18 Miles From Memphis” is one of the best country songs ever! Brian Setzer is an absolute giant on guitar. The first time I heard Stray Cats coming out of my radio I was floored. My buddy said, ‘That’s an old record. Why are they playing that?’ But I knew that was new music in the old style. Consider that Brian Setzer revitalized 2 different genres in his lifetime–Rockabilly and Big Band. That’s a unique kind of genius. Love his playing and his tone and his whole approach. Big fan of Lee Rocker, too (naturally). They may actually deliver on that promise of ‘best Stray Cats album ever’. There’s not many I’d trust to make good on that! I watched Stray Cats do ‘Rock this Town’ on some variety show when I was a kid and I knew what I wanted to be when I grew up – Brian Setzer. Can’t wait to hear the new record! This makes my day. They do a great version of The Race is On with Dave Edmunds. Great news! Hope they come by Dallas. Brian Setzer is one of the most underrated guitarists of our time. He also writes great songs that translate really, really well with slim and lee with him singing. I look forward to this. The only thing I question is bringing the recording to Nashville. The first throwback music act that I remember making it to rock radio was George Thorogood in 1978, which I when he released his second album Move It On Over. The title track got a lot of play on at least one of the New York rock stations. Was surprised to find out that it was a Hank Williams song (I wasn’t ready for Hank for about another 10 years). Now, maybe he didn’t become a real national success until Bad To The Bone came out around the same time as when the Stray Cats hit it big. 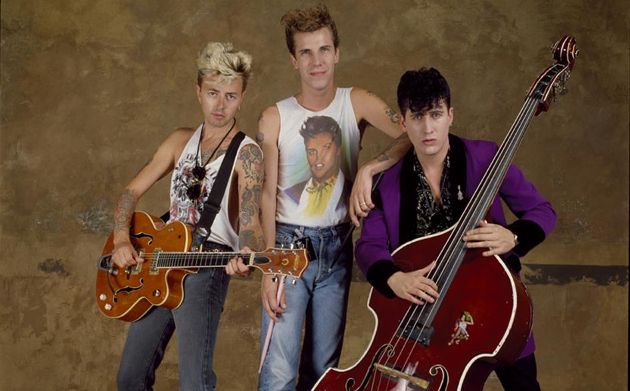 I liked the Stray Cats at the time, but not enough to buy their albums at the time. From a rockabilly perspective, I preferred Robert Gordon, who was definitely wilder. Also, The Blasters started around the same time, but I never heard of them until 20 years or so after they started. I think She Na Na may have been the first throwback act. They played Woodstock in 1969 and started a 1950’s revival fad that helped bring on American Graffiti (the movie), Grease (the musical), and Happy Days (the tv show). Have been a big Brian Setzer fan throughout his “Orchestra” phase. Perhaps less so in the Stray Cats’ days, but that was just the short attention span of a loser in his mid-teens. The big irony is how acts like the Stray Cats can do Country a whole lot better than the current crop of “stars”, when they have a mind to. Stray Cats were that first band for me that eased me over from the punk rock side back in the late 90’s when I discovered them. They’re pretty much responsible for my deep dive into roots music. I kept wanting to know what came before that, and before that, and before that… I’m super excited for this. They better be playing Minneapolis. Really excited, just please don’t make another Choo Choo Hot Fish.